Seen while on a film shoot in Jamaica. 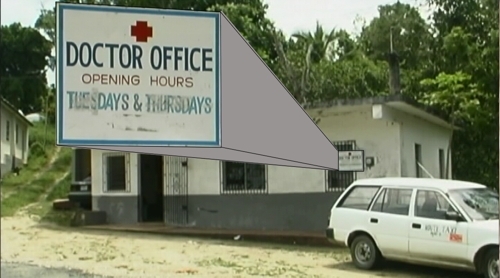 A Medical Clinic open only on Tuesdays and Thursdays. Latin America, like every other region in the world, is experiencing the effects of population aging. However, aging in Latin America has unique characteristics and these characteristics point towards aspects of aging where most attention from healthcare providers and most attention from policy makers and advocates is required. In Latin American and the Caribbean, populations turning 60 years of age after the year 2000 will be particularly fragile because they survived unfavorable conditions in early childhood. Most countries in this region are developing and experienced rapid mortality decline beginning in 1930 or 1940 that was characterized by the spread of medical knowledge and technology and to a much lesser degree, by improvements in standards of living. This mortality decline, added to changes in life styles and exposure to substances, produced three outcomes: first, a decrease in the level of communicable diseases and a corresponding increase in the proportional contribution of non-communicable conditions; second, an increase in frailty of cohorts born right before, during and shortly after the implementation of medical advances; and third, a persistence of communicable diseases because root causes like limited access to clean water, poor education, and insufficient health coverage and health services that can provide preventive measures, still prevail. These outcomes put vulnerable populations, such as older adults, at higher risk of disease, disability and mortality. These demographic characteristics of aging in Latin America place older adults in a very difficult situation. Despite the protective role of extended families in the care of older adults, specialized care is limited and policies targeted at protecting vulnerable older adults are limited and take a long time to get implemented. The number of Geriatrics programs is limited and the shortage of Geriatricians is one of the largest compared to other regions in the world. Even worst, there are many countries in Latin America that don’t have Gerontology programs. The number of healthcare providers trained in the care of older adults is therefore very limited and unlikely to improve in the near future. In a globalized era like the one we currently live in, regional problems like the one presented above have a toll not only on the region but worldwide. The US Census projects that Hispanics will be the largest population group in the United States in the near future. This group will bring all the problems previously presented and pose an important health challenge for developed countries where migration usually occurs. As researchers and healthcare providers we need to study these problems and conduct cross-national comparisons that may help us design policies and interventions that can help older adults have better quality of life. As a society we are not ready for the Aging Revolution that is coming upon us. Even worse we are assuming that aging follows a single pattern around the world. We must understand the unique characteristics, different countries and regions have and develop our interventions based on these unique characteristics. This week’s Guest Blogger is Rafael Samper-Ternent M.D., Ph.D. He is currently a researcher at the aging institute at Javeriana University in Bogota, Colombia. Previously he was a fellow at the Sealy Center on Aging at UTMB. Palloni,A., & McEniry,M. (2007). Aging and health status of elderly in Latin America and the Caribbean: preliminary findings. J.Cross.Cult.Gerontol, 22(3), 263-285. Palloni,A., Pinto-Aguirre,G., & Pelaez,M. (2002). Demographic and health conditions of ageing in Latin America and the Caribbean. International Journal of Epidemiology, 31(4), 762-771. Wong,R., Espinoza,M., & Palloni,A. (2007). Mexican older adults with a wide socioeconomic perspective: health and aging. Salud Publica de Mexico, 49 Suppl 4 S436-S447.